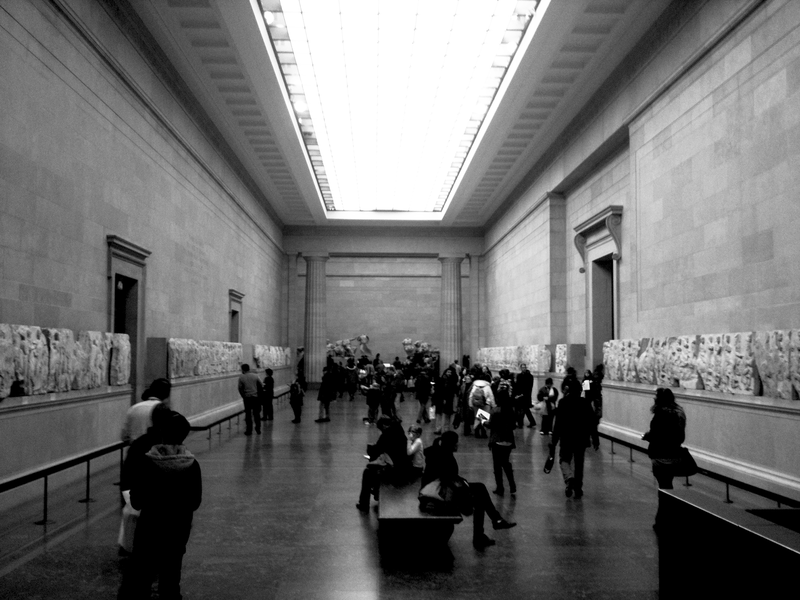 The Duveen Gallery is an I-shape room with the entrance at the middle of the long side. The frieze is arrayed in the main exhibition area, attached to the wall at a height of 1.45m-2.05 m from the floor. 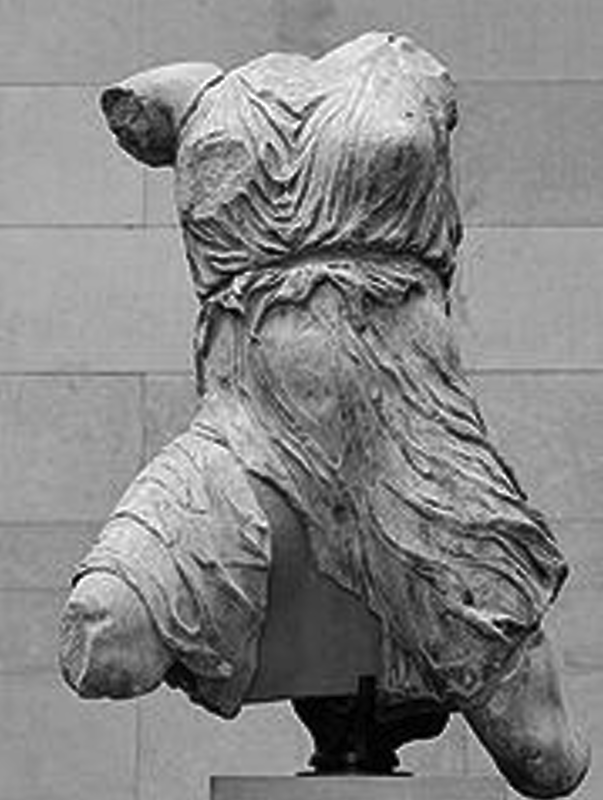 The pedimental statues are free-standing at either end of the gallery, while the fifteen pieces from the metopes, are also attached to the walls, around the pediments. The background walls are covered with stone blocks, of approximately the same size as the pieces of the frieze. There are also four new columns in Doric order, two at each end, and a skylight along the central space. 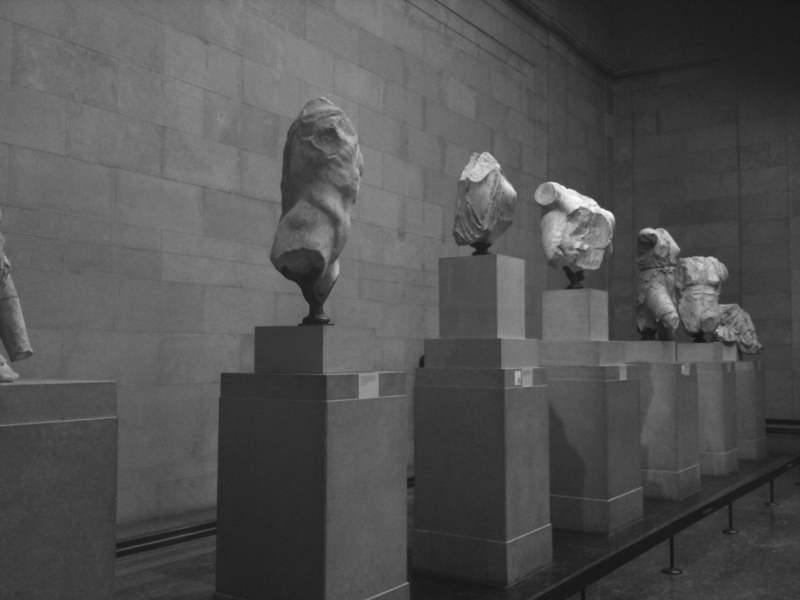 It could be said that at the British Museum the pieces were arrayed with the criteria of the time, as being artifacts, masterpieces, to be admired, studied, drawn and copied by artists. For this purpose they are displayed at eye’s level, according to the prevailing standards of art gallery layout, with the visitors standing at the inside and the exhibits arrayed all around them. This is the reverse of the original monument layout. The non-specialist visitor may need continuous reference to plans and charts to relate the exhibits to their original positioning on the monument. This may result in a constant and tiresome exercise of imaginative reconstruction. It can therefore be argued that the context of the marbles has been ignored, as there is little information provided about the original placement of the pieces. The exhibits are presented as individual objects of art, with little relation to the Parthenon as a building.